Nemetschek Frilo provides different working environments, depending on user’s preferences. The usual way will be working with full control over all projects and items. Nemetschek Frilo offers a simple and efficient project environment to handle all the data necessary for one complete structural analysis. Frilo calculations are item based, which means that the analysis comes up with a set of many independent items with appropriate documents. The management of all the items is done by the Frilo.Control.Center organizing all projects with all items in one view. Projects may be physically distributed over many locations, including cloud ones. All organizational information is stored in a central SQL database which may be located on a local network as well as on a web server in the cloud. Due to this database approach the performance and stability of the Frilo.Control.Center is excellent, no delay for searching across the network affects your daily work. The real item data is accessed only if the item is opened by a Frilo program. The calculated Frilo items have one small PDF document as a result. To combine all single documents to one digital static document, Frilo offers the Frilo.Document.Designer. This application handles all PDF documents, not only from Frilo, also from any other application. Especially all Office-documents like Word or Excel documents can be integrated in a perfect interactive way. You can work with most of the external documents directly inside the associated applications, simply double click to start, and after storing it, the resulting PDF document is created automatically and updated in the central document. You have no copies of data - you work with the original data. Lot of functionality is provided to organize all documents with respect to the position and optionally also with respect to the chapters. Adding personal comments is also possible. You can define your own headers, you can define the layout of the Frilo documents in detail and you get a table of content with continuous page numbering. Changing positions of items or inserting new documents results in a completely automatic renumbering. After finishing a document, the page numbers may be fixed and all future changes results in an additional numbering with appendix of characters to the page numbers. Leaving the office it may be a great advantage to have all information with you. Frilo provides a new opportunity using “StaticToGo”. What’s that? StaticToGo is an application running on various tablets, especially on an iPads or tablets based on the Android operating system. All document data is synchronized between the central location in your local network and the tablet. Various projects may be selected for the synchronization process. The user interface on the tablet is very similar to the user interface on your workstation, you can see all projects and all items as single objects. You can add remarks to each object, the remarks are synchronized back to the original data on your server and everyone who works on the structural analysis can see and process the remarks. If your project database resides in the cloud or on a web server, the synchronization between the workstation and the tablet can be done also outside of the office. If you like to use Frilo on your workstation without any project definitions, if you like to use it as an app - you can do it. You can run each Frilo program without any predefinitions, input the requested data into the dialog and get the result immediately, fast and easy. For this application use case, Frilo provides the program Frilo.Start. 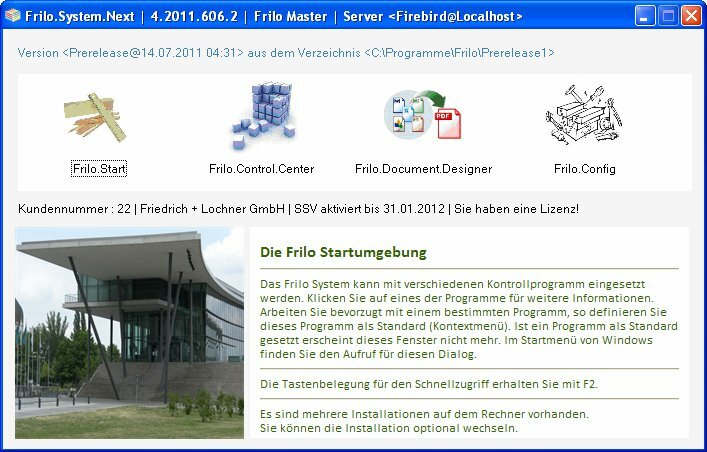 All different control programs for use of Frilo are bound together under Frilo.System.Next, which also controls the installation and update process. Both installation and update are done via web, no CD or any other hardware is needed. Licenses are primarily sent by email and updates of licenses are done from the Frilo web server automatically after an additional order has been processed.